Orange Township Trustee Lisa Knapp listens to numerous complaints from township residents about her blocking them from commenting on her “Lisa Knapp, Orange Township Trustee” Facebook page. Orange Township Trustee Lisa Knapp was confronted by residents with accusations that she has blocked them from her Facebook page. Resident Patrick Ruby said his concern was about the censoring of public comments. He said if the policy is to limit public comment, then all mediums should operate in identical ways. Ruby said, as elected officials, the trustees have a duty to listen and act with all constituents whether they like them or not and whether they agree or disagree with them. “When a government official edits, deletes, and creates false comments and profiles of people or blocks comments of a constituent’s speech, it’s a direct violation of the First Amendment,” he said. Ruby urged the board to establish policies to protect the township and themselves from possible lawsuits. According to Township Administrator Lee Bodnar, there is only one official township Facebook page and the current social media policy only governs that page. It does not govern any of the trustee pages. Communications Manager Amanda Sheterom said the township’s policy for the official township page has been in place since 2014. She said the township administrator and certain staff have access to the page to share things relative to township, county, and state business. “As far as a trustee or any other elected official, they maintain their own page and we have nothing to do with them,” she said. Sheterom said the township has worked with the Delaware County Prosecutor’s Office in past weeks addressing the same issues that residents expressed during the public comment portion of the meeting. Resident Marybeth Sanford said when holding a position of authority, such as an elected official, that person serves at the luxury of the people, especially those that voted for them. Resident Allyson Davy said that she was blocked from Knapp’s Facebook trustee page and doesn’t know what she did to get blocked. She said she has never commented on Knapp’s page. Knapp asked Davy what the problem was with her being blocked from her page. 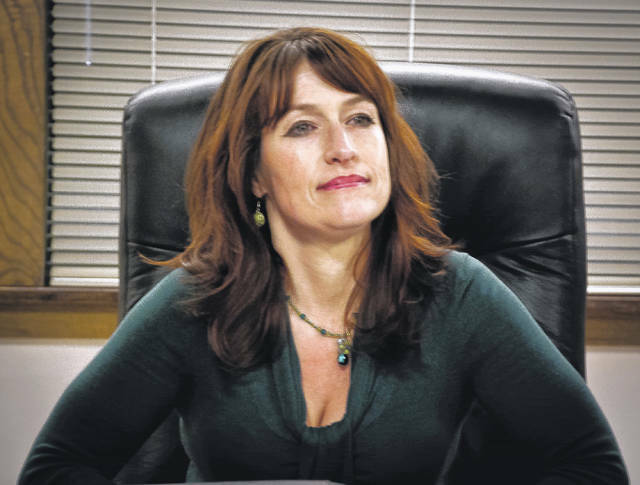 Knapp told Davy that the issue with her blocking people on her page was not township business and she wasn’t going to waste township time by discussing it. Knapp went on to protest that she was blocked by the “Residents for Quigley and Taranto” Facebook page. The page is administered by residents who supported Trustees Rob Quigley and Debbie Taranto for reelection in the Nov. 7 election. Neither are administrators of the page. Knapp said if Quigley could block her she could block others. Knapp continued to insist that he did indeed block her on his trustee page. Coming to Knapp’s defense, resident Susan Tobias said all those that stood at the podium and complained were probably part of a “secret hate group” against Knapp. Township Fiscal Officer Joel Spitzer filed a civil complaint in September in Delaware County Common Pleas Court, Civil Division alleging harassment against a group that includes Knapp, Tobias, and Todd Daviso, a resident of the township. This entry was tagged Bodnar, Knapp, Orange Township, Quigley. Bookmark the permalink.